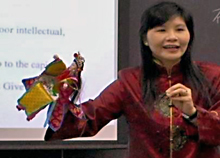 While attending graduate school at Ohio State University, Sue-mei Wu, teaching professor of Chinese Studies, became interested in Chinese folk performance. Since the early 1990s, said Wu, hand puppet theater and Taiwanese Opera have enjoyed “renewed popularity” during a time of rapid social, political, and economic change in Taiwan. Wu intends to use the funds to support her ethnographic fieldwork, the development of interactive language and culture learning modules, and the creation of a multimedia DVD. Wu described the research project as “pioneering” and said it will “help preserve the treasure of Chinese traditional folk arts and culture in Taiwan,” while at the same time giving students of Chinese a bridge to Taiwanese culture and Chinese folk performance. Professor Wu already builds this bridge in the classroom through hands-on activities that introduce students to the subjects closest to her heart. 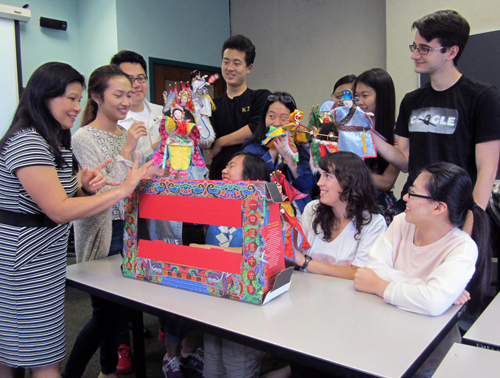 In her class on Chinese Folk Performance Traditions, she teaches students how to work with hand puppets. Wu is pictured here (in the black and white dress) with her enthusiastic students.